This entry was posted on Wednesday, July 25th, 2012 at 4:15 am	and is filed under Celiac & Gluten Intolerance, Gluten-Free Recipes, Seasonal Foods. You can follow any responses to this entry through the RSS 2.0 feed. You can leave a response, or trackback from your own site. As fascinating as I am sure mitochondrial density, movement, and weight loss is, I like pizza!!! This pizza is right up mu alley for summertime. Love that tip on tomatoes – who would have thought?!? I love this pizza. Have had it several times using the arugula from our garden (this time of year). One minor change…I use Udi’s frozen pizza crust! I look forward to eating one of these super easy, delectable pizzas that you actually made yourself one day. Until then, thanks so much for the recipe, and I agree with Carol, that’s a wonderful tip on de-juicing the tomatoes! Yum and yum. 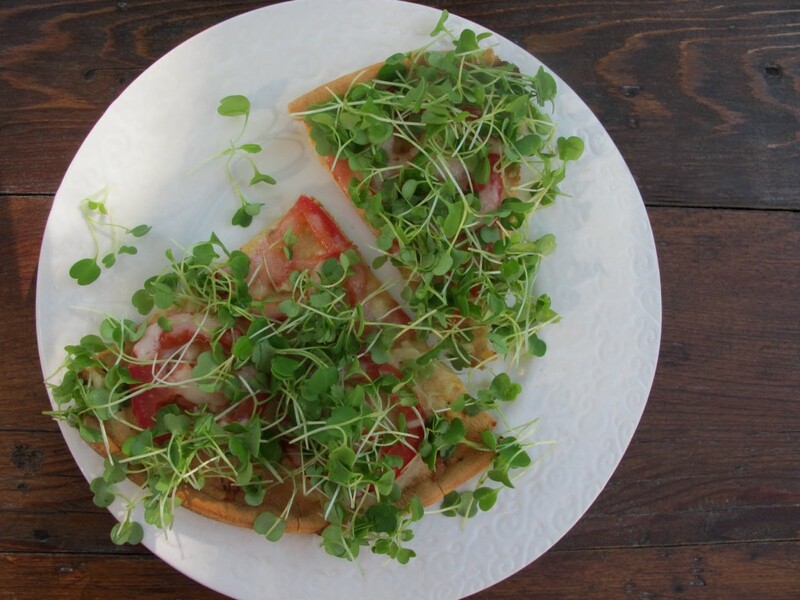 I have some radish micro-greens on hand and will be making pizza soon–thanks for the inspiration! Oh I could go for that right now. Love the micro greens. This looks really yummy with the microgreens and garlic. Can’t wait to try your recipe! Totally awesome! I had to hide the left overs from my pizza from my son, who finished his completely. We used tomatoes from our garden (the salad spinner trick didn’t work for me! But I loved the idea! ), lots of garlic, a little Daiya Dairy Free Mozzarella style “cheese”. I can’t wait until tomorrow to finish my left overs… if they’re still there. Thanks for posting! It sounds like a great pizza. How about goat cheese.Putting the tomatoes in a salad strainer, I would imagine you would not want to turn the handle to fast. To add the juice to make salad dressing sounds fantastic. great idea. Thanks. This sounds amazing! Barbecuing is a great idea! I have looked for your book, Anxiety Food Solution, in stores but I can not find it…does anyone know where it’s available?